Warner Brothers told us back in late summer that they are developing a few different DC comic book properties. It seems that movement in one of those properties is making some waves. Hollywood-Elsewhere is reporting that WB is close to signing Josh Brolin to play Jonah Hex in the film being helmed by Crank directors Mark Neveldine and Brian Taylor. The site accually claims that the deal was done last night, however Brolin's camp has denied the claim, so will keep it as "close" untill further news is revealed. 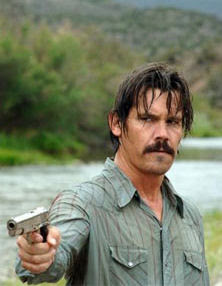 Josh Brolin seems like a natural fit for the role, especially with his recent surge in cinema. Josh Brolin has some amazing range and would be able to pull off the surly attitude of Hex and also his brooding gunslinging persona. Brolin's films have done nothing but generate solid buzz as of late, so landing him, should guarantee some success with the property. Jonah Hex is a western comic that has had various story-arc's that has even covered the supernatural. 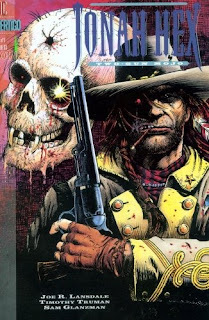 The story follows, Jonah Hex, a cynical bounty hunter who at one point fought for the confederate army and has severe facial scarring on one side of his face. 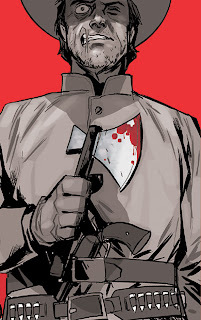 Hex has had both inner and outer demons throughout the comics run, his mother was turned to prostitution, his father sold him into slavery so that he may have safe passage through Apache country, he has had his battles with alcohol, he was the confederate soldier who shot Stonewall Jackson and caused Jackson to lose his arm, had his fiance killed by Indians, and has also had his fair share of battling zombies. Mark Neveldine and Brian Taylor have gone record saying that Jonah Hex will not be, "making a straight-ahead Western but plan to develop the character with some of the supernatural overtones in the hopes of creating a franchise." So I guess that means zombies, but one would hope that the franchise will start with Hex's confederate ties and not just give us Ghost Rider! Hex's epic battle with the Apache Indian, Noh-Tante, who had once betrayed him years before, which leaves Jonah's face drastically scarred would make for a great battle sequence and a huge part to the first chapter of Jonah Hex. Thoughts on Jonah Hex? Are you a fan of Mark Neveldine and Brian Taylor? I guess those shots of Tom Jane as Jonah Hex were just Jane wanting the part. I personally really like Jane, but he is definately a 2nd tier actor and has yet to bring in the dollars on any property he has starred in. Does Brolin fit the bill for Hex?